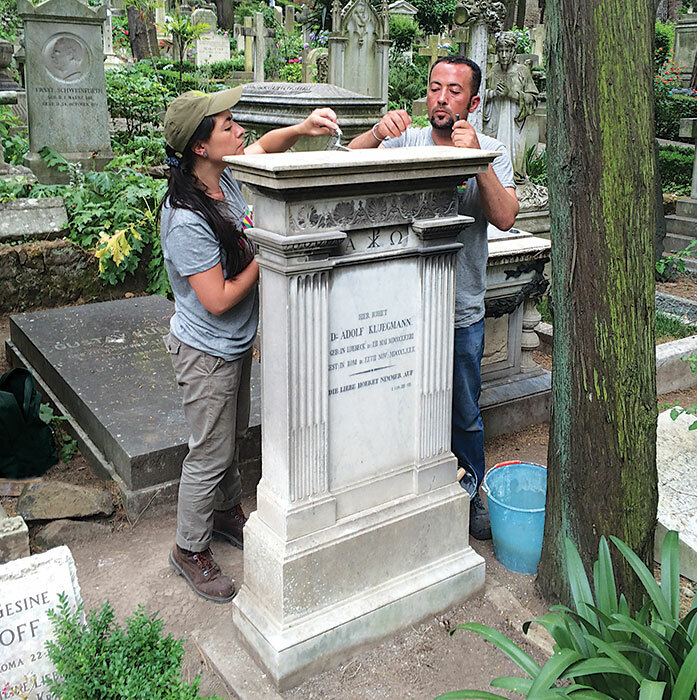 Two participants in the stone conservation course making structural repairs to a tomb in Rome’s Non-Catholic Cemetery. Photo: Benjamin Marcus, GCI. This past July the Nineteenth International Course on Stone Conservation concluded in Rome. A partnership of the GCI, ICCROM (International Centre for the Study of the Preservation and Restoration of Cultural Property), and the Non-Catholic Cemetery in Rome, the twelve-week course brought together twenty midcareer conservators, architects, scientists, and engineers. Participants came from Palestine, Serbia, Canada, China, Colombia, the Philippines, Japan, Italy, Malta, Zimbabwe, Tanzania, Egypt, Peru, Spain, Georgia, Mexico, Poland, Macedonia, Finland, and Turkey. This marks the fourth time the GCI has partnered with ICCROM to offer the stone course. The course took advantage of ICCROM’s laboratories and library, as well as the opportunity to experience Rome’s vast heritage of stone sculpture, buildings, and sites. Divided into modules, the course covered all aspects of stone conservation, including the history and theory of conservation; geological and material characteristics of stone; deterioration mechanisms and methods of survey and analysis; and conservation interventions and criteria for selecting and implementing treatments. More than thirty international experts in stone conservation led classroom lectures, laboratory exercises, and site visits. The course included a weeklong study tour of relevant sites, including marble quarries in Carrara and ongoing conservation projects at the Pisa Cathedral and Venice’s Rialto Bridge. During the course, participants applied what they learned to conservation problems affecting historic tombs at the Non-Catholic Cemetery, the final resting place of many poets and artists, including John Keats and Percy Bysshe Shelley. The eight tombs studied ranged from a life-size marble sculpture to a colored stone sarcophagus, and they presented interesting conservation challenges, such as structural problems, soiling, and decay caused by biological growth. Course participants carried out a conservation project from start to finish, beginning with documentation, conditions assessment, and materials analysis, followed by implementation of conservation treatments, including structural stabilization, mortar repairs, cleaning, and consolidation. The 2015 course provided an in-depth and intensive program and the chance to develop a professional network that will serve the participants throughout their careers.